Financial service industries are up against a generational cliff. As a whole, financial service organizations and younger generations struggle to relate to each other. This is especially problematic because the whole industry is based on trust and relationships. Video has emerged as a key solution to help with this. Why? We are naturally attracted to video content rather than large blocks of text. Video allows financial services to build more transparent relationships and explain complex financial products simply. Even though video has proven to be a great way to connect financial services with today’s changing buyers, more than 90% of financial service organizations still have no video content. To inspire you, and show that video does have a place within the financial service sector, we’ve rounded up 6 top organizations using video. Not only are they using video content, but they also use it in multiple different ways to engage and embrace their new buyers. LeaderOne Financial is dedicated to facilitating the dream of homeownership by providing World Class Service. When potential new customers hit their homepage they are greeted with a wealth of knowledge at their fingertips (including a video section). 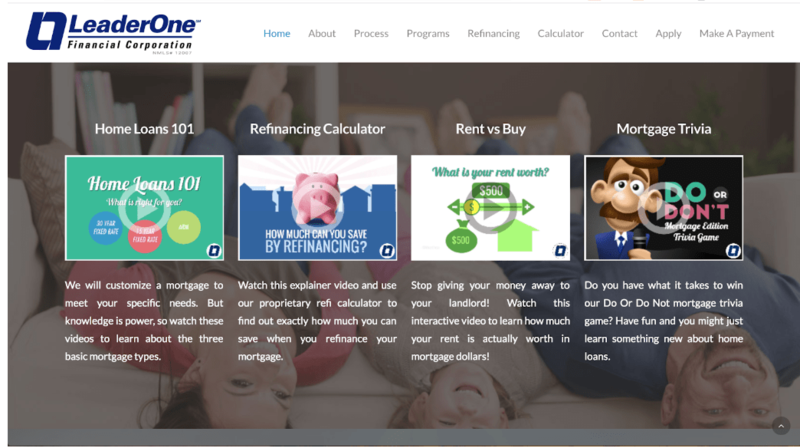 Not only are the videos informative and easily digestible ways to answer potential customers key questions, LeaderOne immediately engages their audience on their homepage— the area where most customers will look for information about the brand and its products. Saxo Bank is doing something different with video by live streaming technical analysis of the day. Saxo’s Morning Call is the key point of daily contact between their experts and the broader public. They offer real-time access to their chief economist and strategy team as part of a greater effort towards increased transparency, flexibility, and leadership in the field of online investing.Their audience can join them live daily (for a quick 10-20 min daily broadcast) or catch the on-demand version later. It’s a great way to create a sense of urgency which increases engagement with their viewers. Bank of America could easily fall into multiple categories in this post. They create some outstanding video testimonials and interviews for their audience. 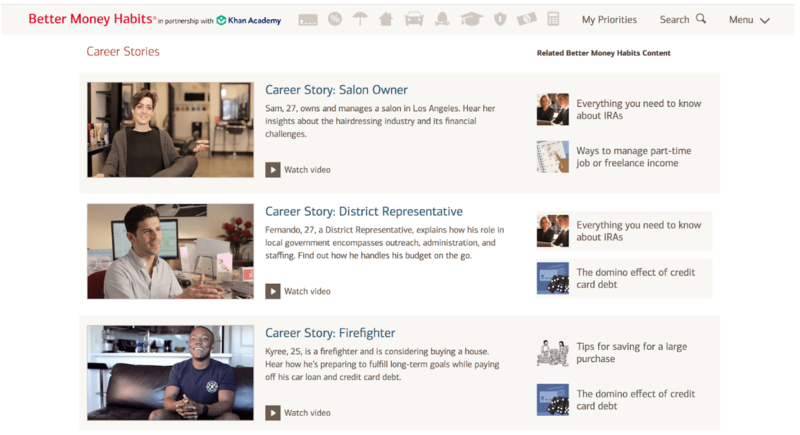 In their new video series, Bank of America asked real people in real jobs how they’re handling financial responsibility as a young American so viewers can find out how their peers are navigating the world of work in their own words. How they organize their video content is what makes them stand out. Their video library pulls together all of the videos in this series in one central location. This allows viewers to easily navigate between videos and increases the time they spend on the Bank of America site. 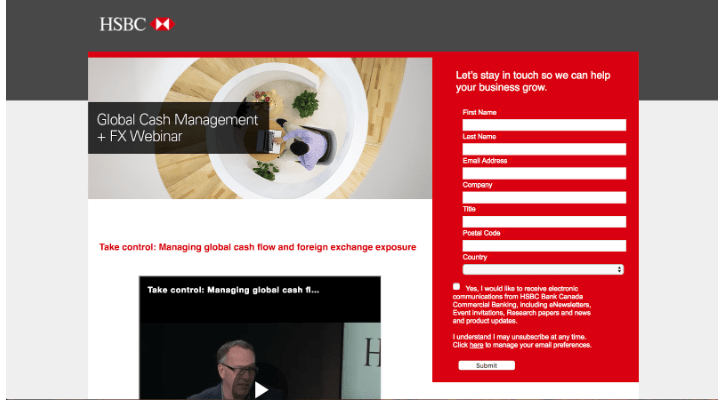 HSBC Canada has started using Webinars to help educate their audience on how to take control of their cash flow. They feature top experts who share insights and tools, to help businesses better manage foreign exchange exposure and transactions. Webinars are a great way to break to jump start your video content because you can use them in multiple ways. Not only can you host the live event but once it’s done you can promote the on-demand recording, cut it up and add pieces to a blog post, or turn the content featured into a great infographic. Sunlife Financial know that customer testimonials are extremely important for any organization. 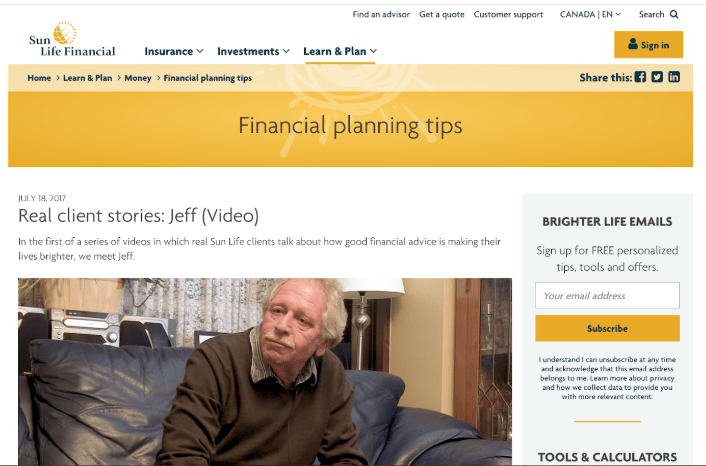 They help build trust and let potential buyers hear how people just like them use your product or service.In the first of a series of videos, Sunlife asked real clients to talk about how good financial advice is making their lives brighter. A customer testimonial video puts a face to the name. It allows you to connect a real human to the story and convey the emotion through body language, and dialogue. This helps you deliver a richer experience and keep your audience engaged. Wealthsimple was quick to jump on the video bandwagon. They knew that they could better educate, connect with, and highlight what they do through video. Their videos garner over 1 million views on average and are just people discussing money (and investing). Their brand messaging “Investing for Humans” is amplified by using video to bring real faces to the story. As buyer expectations evolve, so do many companies and video is a great way to make the transition easier. We hope these 6 organizations inspire you to find ways to use video to educate, engage, and delight your audience. The post 6 Financial Service Organizations Crushing It With Video appeared first on Vidyard.